Is there be a better place to search for the true meaning of love than the birthplace of those most famous of lovers, Romeo and Juliet? In the Italian city of Verona, there’s a whole tourist industry based around Shakespeare’s famous tragedy and a society dedicated to replying to the letters addressed to Juliet, which arrive from all over the world. Most of the letters are from women, though some are from men, bemoaning their romantic frustrations – an unfaithful lover, an unrequited love, a friend who doesn’t return their romantic feelings. It’s the latter situation that dogs Canadian teacher Glenn Dixon in this most enchanting of memoirs about love. 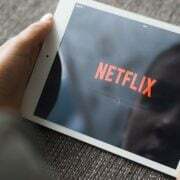 Dixon recounts his platonic friendship with a woman called Claire who, quite frankly, sounds like she has led him up the garden path for almost two decades, but who he spends years quietly pining for, while she pursues a series of ill-fated relationships. Glenn travels to Verona in search of some meaning in his life and there he works from a small office at the ‘Club di Giulietta’ – where thousands of letters arrive each year. The letters to Juliet first arrived in the 1930s and by the 1980s the steady flow inspired a baker, Giulio Tamassia, to found the Club to cope with profusion of missives. His daughter Giovanna has since taken over and today a handful of ‘secretaries of Juliet’ sort the letters into languages and share the replies. Glenn Dixon becomes one of those secretaries, working with Giovanna and the small staff – some local women, others from other parts of Europe – to craft meaningful replies. 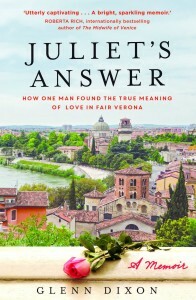 In doing so, he searches his own heart for answers to his romantic woes and, travelling around Verona and to the famous house of Juliet (Casa di Giulietta) – visited by so many tourists the right breast of Juliet’s statue has been worn away – Glenn explores Shakespeare’s meaning when he wrote Romeo and Juliet. In his quest through this ancient city, he discovers how much of Shakespeare’s lovers’ real history is left in Verona and finds the evidence that the play was based on a real-life, ill-fated relationship. In his narration, Glenn crosses back to his Canadian classroom where he teaches a mixed group of high school students the meaning of the same play, and he and the students act out each scene. Many of the students are troubled adolescents, including one who, like Shakespeare’s star-crossed lovers, faces the possibility of an arranged marriage. In studying the lines of Shakespeare, Glenn and each of the students search for answers to their own life problems. Although Glenn Dixon is an inspirational English teacher and deeply passionate about Shakespeare, after more romantic troubles with Claire in Canada, he decides to give up teaching to travel to Verona once more. On this second trip, through returning to the Club di Giuletta and the revival of a friendship, Glenn finally does find the meaning of true love. Part travel memoir, part love story, and a philosophical look at the nature of romantic love, Juliet’s Answer is compelling and uplifting. Like the best memoirs, it’s self deprecating, humble and absolutely honest. Glenn’s story is irresistible and for anyone interested in teaching or Shakespeare, or simple a moving story about finding love, this book is for you. A writer, musician and documentary filmmaker, Glenn Dixon taught Shakespeare for twenty years before heartbreak led him to Verona to become one of the famous ‘secretaries’ who answer thousands of letters addressed to Juliet, of Shakespeare’s Romeo and Juliet, from lovelorn people all over the world. He holds an MA in socio-linguistics. Click here to purchase a copy, start reading the first chapter. CCC to conduct public hearing into 2016 Gold Coast council election Are smartphones keeping your family awake?